Credit card debt can be totally eliminated, or discharged, in bankruptcy. It does not matter if you are current on your payments, if you are a month or many months behind or if you have been sued and are being garnished for an old credit card debt – at any stage you can stop the collections as soon as you file bankruptcy and eventually discharge the debt all together. Of course, once you file bankruptcy you can not use the credit cards any more. You will have to live without a credit card but a bank debit card can be used in almost any situation a credit card can be used. Eventually after filing bankruptcy you will be able to rebuild your credit to the point where you will have access to credit cards again. If credit cards receive any money in a bankruptcy, they are among the lowest priority of debt to get paid known as “general unsecured debt”. This class of debt may be paid a pennies on the dollar in a Chapter 7 liquidation or a Chapter 13 repayment plan. 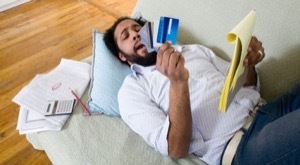 In most Chapter 7 cases, credit card debt is not paid at all. In Chapter 13, credit cards get anywhere from 0% to 100%, depending on the ability of the debtor to pay. In some cases, a bank asks a borrower to put up collateral for a credit card. Some of these agreements are “cross collateralization” agreements and often involve a car loan with the same bank. If you took out a credit card with a bank you have a car loan with, make sure it was not cross collateralized if you are considering bankruptcy. Another major way credit card debt is excluded from the discharge in bankruptcy is when a credit card company wins an “adversarial proceeding” in bankruptcy court based on fraud. A credit card company must prove that the charges were made on the card when the debtor had no intention of paying them back. These are hard cases to win, though if more than $500 was charged for luxury goods or cash advances within 90 days, the case is a bit easier because the there is a presumption that the debtor committed fraud. Otherwise, the credit card company has to show the debtor committed fraud based on all the circumstances of the case – how much debt the debtor already had, whether any payments were made after the charges, how long the occurred before filing and whether the debtor had contacted a bankruptcy attorney before making the charges, among other common sense considerations. It is hard to prove a fraud case because creditor has to convince a bankruptcy judge what the debtor’s state of mind was through circumstantial evidence and bankruptcy judges are supposed to favor giving the debtor a fresh start. However, it is not impossible for them to win a fraud case. If you have made substantial charges on a credit card, it may be a good idea to wait to file even if you never thought you would file bankruptcy when you made the charges.